What Do Creators Owe Their Fans? Or: Say It Ain’t So: Captain America is Hydra and Fans Say NO. I’m just now coming up for air after working hard to meet a deadline. I have a story I’ve been revising for re-release in an expanded version, and another in edits. Now that I’ve finished the revision, I’m taking a few days break before looking at the one in edits again–I find letting the story ‘rest’ a bit is better for the final read-through. I’m waiting to hear back from my publisher on a third story as well–so let’s just say I’m happy with my production at the moment. When I take a break from writing, I allow myself indulgences I restrict at other times. That’s not to say I don’t read books or watch television when I’m in the middle of a story, but I only have so much time in the day. When I’m working on a story on a deadline, I can’t binge-watch on Netflix or stay up all night reading fanfic. But now that I’m on break, I can poke around my favorite fandoms and see if there’s anything that grabs my fancy. One of the beauties of fandom is pretty much no matter what happens in canon, there’s plenty of ‘fixit’ fanfic to go around. Something that happened recently in the Marvel fandom had me wondering just what exactly do writers and creators owe their fans? In May 2016, the editors at Marvel Comics announced that Steve Rogers had been–and always will be–an agent of HYDRA. The fans HOWLED their outrage, taking to Twitter, Tumblr, Facebook, and other social media outlets to shriek at this latest plot twist in the long-running series. #SayItAintSo became a hastag on Twitter, with even actor Chris Evans, who portrays Steve Rogers in the movies, weighing in. I don’t blame them. HYDRA is the antithesis of everything Steve Rogers stands for–the idea that he could be a secret HYDRA agent is so out of character the soul recoils at the declaration. Not to mention the ghosts of the original creators. Steve Rogers/Captain America was created by Joe Simon and Jack Kirby, two Jewish writers at a time when the Nazi regime was herding thousands of Jewish nationals into prison camps where they suffered and died. 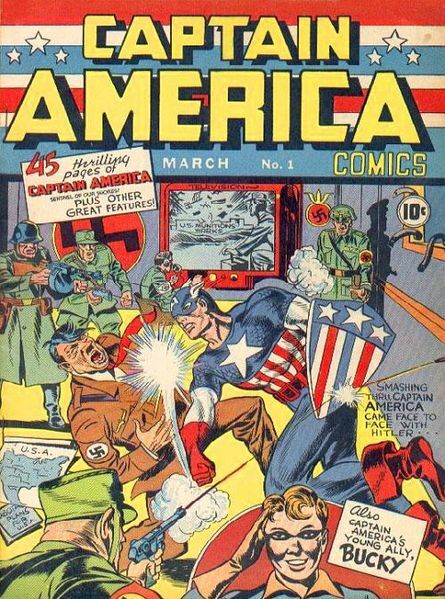 It’s no coincidence Captain America was depicted on the first cover of his series punching Hitler in the face. It was a conscious decision on the part of the writers, who were repulsed by the Nazis and felt war with the Axis powers was inevitable. If the current writers of the Captain America comics wanted to stir things up, they certainly got their wish. Pleas of ‘please stay calm’ fall on deaf ears as head writer Nick Spence was attacked so hard on Twitter, he received death threats. I’m not surprised, frankly. Not after skewering a character that’s been beloved for 75 years. Not after laughing about his plans and boasting that this isn’t a temporary plot twist, and had readers been paying attention, they would have seen the clues all along. You know what? That’s his prerogative: to spit on the memories of the original creators of Captain America and enrage the fan base. I recall a WTF moment when J.K. Rowling paired Hermione and Ron, despite the fact Harry and Hermione had tons more chemistry together and were much more similar in mindset to make a logical pairing. I remember shaking my head when Charlaine Harris received death threats because fans were in an uproar over how her Sookie Stackhouse series ended and who she paired the main character with in the end. But I’m a big girl. I can stuff my fingers in my ears and sing ‘la-la-la’ if the writers/creators of a beloved series take it in a direction that is unpalatable to me. I wouldn’t dream of sending death threats or hate mail to the people who, in many cases, are the original creators of the characters I’ve become so invested in. They aren’t mine, even if they are beloved. In all honesty, I suspect I know why Nick Spence is taking the series in the current direction. It’s because as it stands now, many people find Captain America the most boring of all the Avengers. He was hugely popular during WW2, and then his popularity fizzled when there were no clear enemies to fight. He’s been recast, reincarnated, and resurrected many times. The franchise has to keep the bottom line (and dollar) in mind. I’m reminded of the scene in Legend in which Lily is seduced by the darkness–and becomes ten times more interesting than she was before. Oh, I get it. Villains are simply more fun to write. I have problems with the mentality that we need flawed heroes so they can be more relatable to us. I feel like I need to have Inigo Montoya say, “You keep using that word. I don’t think you know what it means.” I’ve written previously about why I don’t think Captain America is boring, as well as why we need heroes. See, here’s the thing. We need something–someone–to believe in. We need someone to look up to. Relatable? Yes, perhaps in the way that frail little Steve Rogers became a Superhero. But what some people seem to forget is that Steve already had the heart of a hero even when he was too ill to fight. Relatable doesn’t mean feet of clay, or stark betrayal. We love our heroes because they give us something to cling to in an ever-increasingly scary world. We love our heroes because they give us the courage to stand up to bullies and say the right thing and refuse to give in to intolerance and hate. We need our heroes to be better than we are because we need someone we can strive to emulate–not relate to in our failings. So yes, I’m an adult. I can walk away from any franchise if it utterly disappoints me. That’s my right, just as it is the right of the creators to perform outright character assassination, should they choose. I can make up my own endings, tell my own stories. I can ‘fixit.’ But here’s the thing. I am an ADULT. Because you as a creator may not owe anything to me, but when you’re dealing with such an iconic character as Captain America, I think you do owe something to those young fans. Particularly if the character is not your creation, you’ve merely stepped into the creators shoes. As for me, I leave you with this classic Bonnie Tyler song. Ignore the 80s style production values, close your eyes and listen to the lyrics. Because we all need heroes. 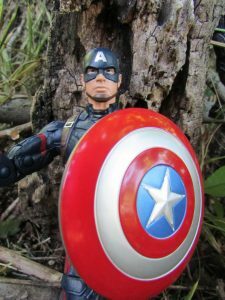 This entry was posted in Uncategorized and tagged #MondayBlogs, captain america, heroes, Sarah Madison, writing by Sarah Madison. Bookmark the permalink. Awesome post! I’m with you. I’m okay with authors (i.e. *original creators*) taking characters in directions I may not love. I wept with everyone else when Russel Davies killed of Ianto in Torchwood. But it was his character. His story. His vision. We knew all along that Torchwood employees don’t live long. 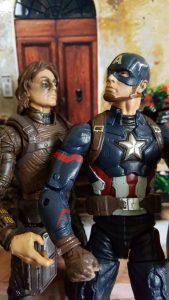 But what the writers are doing with Cap is just plain wrong. It is, exactly as you said, not their story to mess with (and the statement that we should have seen it coming? Seriously? Not a chance). To quote someone else: a move like this spits not only in the faces of the fans, but of all the writers who have come before, not to mention the original creators. To not see the backlash coming is almost as short sighted as the idea. I’m also totally with you on the need for heroes. There are ways to make our heroes relatable that don’t entail destroying everything those heroes stand for. A *good* writer would know that and be able to deliver. This new writer seems to simply be going for quick (and cheap) sensationalism. I would never send anyone a death threat (or even wish them any particular ill) over something like this, but I don’t think much of him as a writer either. I agree with you so much here. Particularly with the sense of inherent laziness on the part of the new writers. One of the reasons we see so much UST in television shows is because it is *hard* to show a good, healthy established relationship. But it can be done. And yes, it IS spitting on the memories of the original creators, as well as the spirit of the character they created. Sarah Madison recently posted..What Do Creators Owe Their Fans? 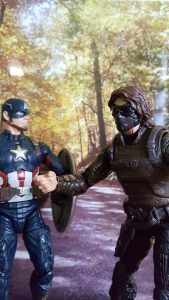 Or: Say It Ain’t So: Captain America is Hydra and Fans Say NO. I guess I’m just happy that it’s not real. I’m not happy about the direction they have taken though. I’d like better writing rather than them depending on this plot twist. I don’t read comics though so I guess it won’t matter to me unless they put it in the movies or TV shows. And that’s something I can walk away from–if they put it in the movies…. Grrrr.